Note: This review contains a mid-game spoiler, flagged in the text. Those who want to play the game fresh may not want to read any further. Seeing dead people must be a traumatizing gift, but it can't be as bad as smelling them. While Jodie Holmes kneels next to a lifeless lump, steeling herself for a violent flash of this poor man's final moments, it becomes my job to funnel his ethereal post-existence energy – represented as a spooky mist rising from the body – right into her meticulously rendered face. Beyond: Two Souls is a game about life and death, except when it's about getting a face full of ghost farts. It's hard to ignore Beyond's insane fluctuations between bravery and bungling as you play the dual roles of Jodie, a delicate but determined woman with psychic abilities (and the likeness of Ellen Page), and Aiden, the spectral entity tethered to her and the true source of her astonishing spoon-bending powers. When scientists try to discern the nature of their relationship, they don't know it's really you flying through the room and the walls, possessing people and riling objects as if you were firing at them with a slingshot. The freedom you display as Aiden has a chilling effect on the people in the room, almost as if the game itself is frightened by an entity with so much agency. Like Heavy Rain before it, Beyond: Two Souls is a restrictive game that sacrifices repeatable mechanisms and emergent scenarios for a cinematic structure, with objectives propelled by the needs of the scene more than the needs of the medium itself. By switching between Jodie and the invisible Aiden, you complete scenes set during crucial points of their lives. These scenes are presented out of order and have objectives that can be sweet or grim. A teenage Jodie uses Aiden to smash up her room in a tantrum, and later assassinates a warlord in Somalia during her stint in the CIA. Sometimes Beyond's scenes manifest as bravery – at least in the space of visually lavish mega-games – because it elevates the mundane to the glossy level usually reserved for explosions and spaceships. Developer Quantic Dream occasionally spends its motion-capture money on scenes that would be relatable even if they stood on their own. Having hastily agreed to a date, for example, Jodie tries to hide all semblance of a slob in her apartment. You kick your DVDs under the TV cabinet, collect your dirty laundry, question the necessity of showering and stand in the kitchen, agonizing over what to inflict upon your handsome guest: a pizza or potential food poisoning. When the doorbell rings, the game's invisible judgment of your timely choices is reflected in how well you score. If you catch my drift. Then again, sometimes the money is spent on a bumbling chase atop a moving train, with every police officer in the state climbing out to fight Jodie, because that's what would happen in a movie. She throws a mean punch, but she's already started it by the time you mimic the motion on the right analog stick. All of the combat in Beyond is choreographed like that, making it more perfunctory than decisive, and your options dwindle even further if you happen to possess and control a distracted human with Aiden (press a button, maybe walk a few steps!). The enjoyment of any scene, then, comes from its narrative tension, because your interaction rarely exceeds a shallow tug in the direction of a dot. In other words: the story had better be worth it. While there is some impressive elasticity in how individual scenes evolve – a failure to react early enough means the police will catch you napping on the train, for instance – they aren't convincingly tied to one another. Presenting the crucial moments of Jodie's young and adult life out of order may be justified by the fiction, but that doesn't make it a good idea. In some instances, Jodie is asked questions that you have to answer, having had no opportunity to recall a prior event, or at least lie about one. It's just going through the motions, and navigating her jumbled life in labs, her botched CIA career and the fallout from her friendly ghost is like drawing a jagged arc without a compass. It's as if writer David Cage meditated and said, "Hmm, what's the one thing everyone can relate to in life? Ah, yes, our non-linear existence." It doesn't help that the chemistry between Jodie and Willem Dafoe's Nathan Dawkins, the man who weirdly guards and studies her at a facility for the paranormal, is barely detectable. Perhaps this explains why they swing by a teenager's birthday party, thinking that a rare, 50-year-old poetry book is going to be such a hit. Still, you try to be appreciative of Beyond's storytelling, as maudlin and humorless as it is. You think of all the hard work that artists and programmers put into creating a neon-lit, rain-drenched showdown between Jodie and a SWAT team. And you wonder if you shouldn't be, I don't know, more grateful for seeing an established actor like Ellen Page so closely encapsulated in Jodie, her lifelike eyes darting about and the light bouncing delicately off her skin. 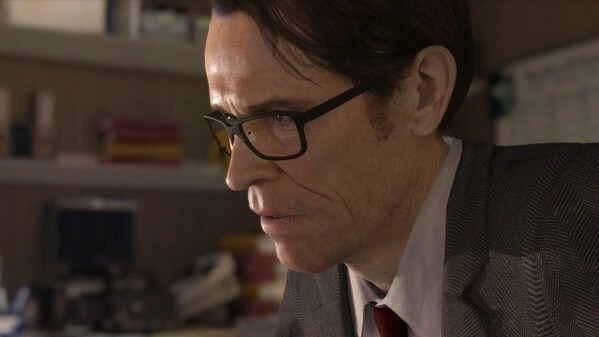 And where did they find room in the PlayStation 3 memory for that mile-wide grin on Dafoe's face? You try to value all that, trying to outrun a plot that simply isn't as sincere as it claims to be, or good enough to justify the impressive technology and how you've been relegated to being the backseat driver of Ellen Page's star vehicle. When she learns [mid-game spoiler alert] that the warlord she killed for the CIA was REALLY THE PRESIDENT, for example, I laughed until I cried a little bit. Review quote: Beyond totally made me cry. The goofy writing ("He was the democratically elected president!") and lavishly created characters are practically begging to be trolled, and much like Aiden resists his tethered companion from time to time, so too does the player try to exert some control. It's hard not to feel insulted when the game throws you a bone and halts a scene, just for you to make a trivial motion in it. (Pick up the glass! Take the book! Pour the wine!) It was more fun to reject the pity interaction, leaving the motion-captured people frozen in time forever, like Leslie Nielsen in a Police Squad epilogue. Playing Beyond: Two Souls lies somewhere between vicariousness and voyeurism. It's the study of a person, attached to an otherworldly being that thrives on a different kind of freedom. Though it uses the language of both games and movies, it's usually the most interesting when it abandons big-screen bluster to focus on minor dilemmas that strengthen the protagonist as a person. Beyond that, you're just the ghost in a ghost story, only appearing when the scene calls for a cheap scare. This review is based on a retail copy of Beyond: Two Souls, provided by Sony.